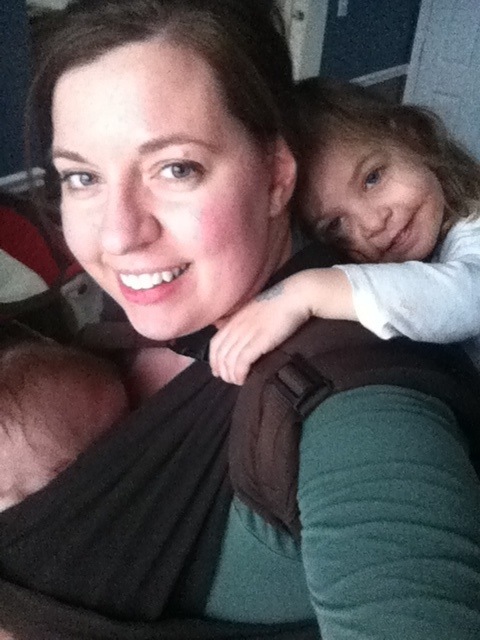 This is my 22nd installment of Babywearing Stories 365. Each installment features a babywearer in 1 photograph and their answers to 5 questions. My goal is to normalize, promote and celebrate daily Babywearing, moving beyond *what* we use to carry our babies and shifting focus back on *why* and *where* we carry. I hope to share the stories of moms, dads, and babywearing caregivers all over the world. Enjoy! My name is Liz and I’m the proud mama of a busy 3 year old, Natalie, and a smiley 4 month old boy, Toby. I snapped this photo at home. It was a lazy Sunday afternoon and everyone was wanting to snuggle with mom. I also carry both of them on short walks, or really crowded places. Tandem wearing is also great when both babies are cranky and “needy” at the same time. I wear Toby on the front in a wrap and Natalie rides on back in an ergo. If I’m wearing just one of them I’ve been grabbing my new WCRS. Wearing both of them is a way to keep peace! I can nurse Toby in the wrap or just let him snuggle in for a nap. At the same time I can really engage with my toddler on my back by playing eye spy, singing songs, playing hairdresser as she attempts to braid my hair, or just enjoy the closeness of her that is not as often now that she’s becoming so independent.